Salmon angling on the River Moy picked up further during the week with fish being caught throughout the system. John Howley had a nice 13.5 lbs fish on fly on the Ridge Pool, while the first salmon of the season was reported on the Mount Falcon water. Nial Connolly was the lucky angler with a 7 pounder caught on worm. Further fish were caught on Armstrong's, Rinanney and the Foxford Salmon Anglers' water, while Jeoff Wyles landed an 11.5 lbs. salmon on Gannon's while spinning. Nine salmon were reported from the East Mayo Anglers stretch, three of which were released. French lady angler, Sophie Berthommier, did particularly well catching a fine 10 pounder on fly while guided by Paddy McDonnell. 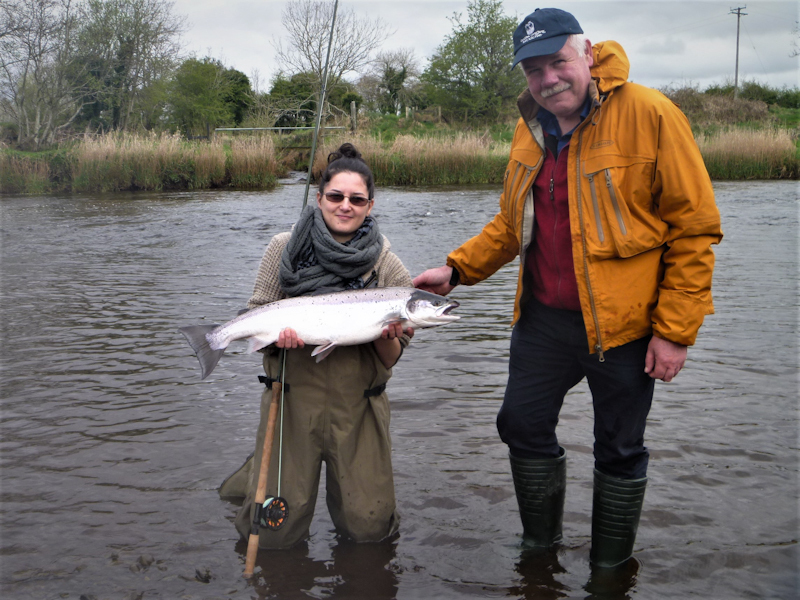 Sophie Berthommier with her fly caught Moy salmon alongside guide Paddy McDonnell. Rory Harkin with his 14 lbs. Carrowmore springer. 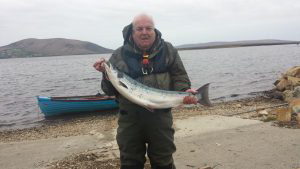 The great spring salmon angling continued on Carrowmore Lake during the week with a total of 14 fish being caught (6 released). Amongst the successful anglers were Davy Elliott, Dave Cazabon, Didier Letormie, Danny Irvine, Mervyn Woods and Owen O'Reilly who all caught fish weighing between 5 lbs. and 8 lbs. However, the best fish of the week was caught by Dublin angler, Rory Harkin. Rory's magnificent 14 lbs. salmon took a Cascade. Other successful flies included Green Peter, Muddlers and small Shrimp patterns. Despite cold north-westerly winds for most of the week, hatches of olives appeared in sheltered bays of Lough Arrow allowing for some good fishing conditions. Luke O'Connell & Paul Casey had 4 trout, while John Gorman & Keith Lindsay boated 4, best at 2.5 lbs. Gerry Martin also did will landing 6 trout, best at 3.5 lbs. Ken Murray & Gerry Kelly enjoyed great fishing over the past weekend catching 11 fish (9 released), best at 3 lbs. Paul Colreavy had a good fish of over 4 lbs. a week ago. With milder conditions this week, hatches of Olives should improve further and prospects for the coming weeks are looking good. 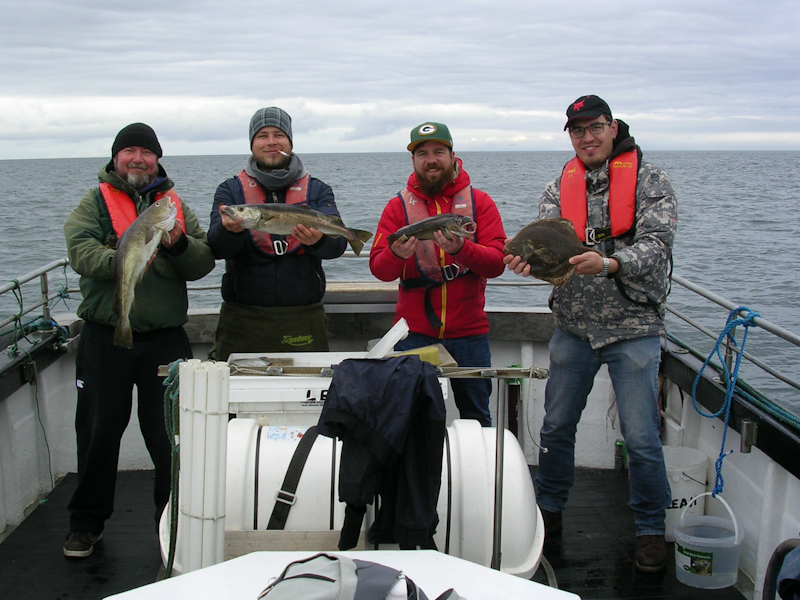 On Sunday 23rd April a party of anglers from the Blackforest area of Germany ventured out on Killala Bay. The anglers set out from Killala Pier at 8.30am. Mackerel were scarce but skipper Donal Kennedy was well prepared providing plenty bait. The first stop produced some fine coalfish. The next drift over sand brought turbot and dabs to the boat along with some lesser spotted dogfish. After a while, the skipper decided to change location again and, as a result, cod, pollack, whiting and about 20 mackerel were caught. All in all an enjoyable day for everyone on Killala Bay! Four happy German anglers on-board "Leah" with their catch from Killala Bay.